I've done a few trades on CryptoBridge, I must admit it's pretty slick and the fees are WAY more reasonable than most exchanges. A little time and I'll bet this is the 'go to' VRC/VRM exchange. After buying some VRC I withdrew to my wallet (for staking) and it was there so fast it was confirmed before I had the wallet open. It is not possible (yet) to buy Vericoin directly with Fiat. While there is no direct method to sell VeriCoin for fiat, a few methods for an indirect sale exist. Transfer VeriCoin from your wallet to your crypto exchange of choice. Wait for the confirmations required so that the VRC can be credited to your exchange wallet. VRC usually takes less than 5 minutes. Exchange VRC to ETH or LTC or BTC. We advise avoiding using BTC as the fees to transfer it to Coinbase are quite high. Click receive on whichever currency you converted your VRC into. 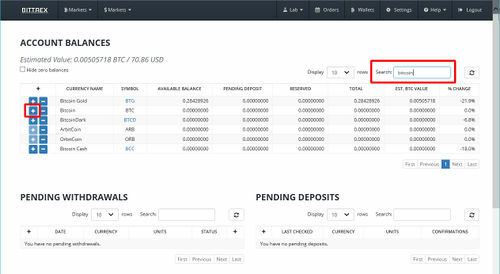 Go back to the exchange where you have your currency and find the "send" option. 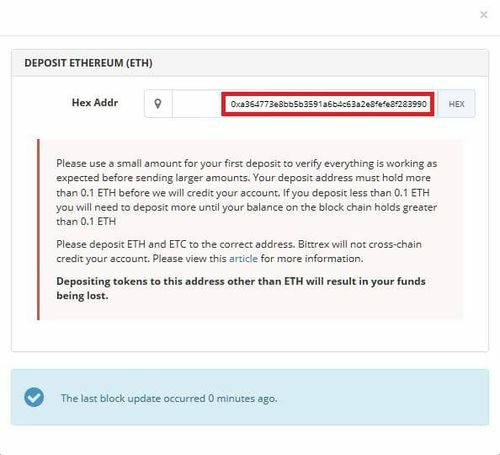 Paste the Coinbase receiving address you copied earlier. Be sure it matches what is displayed on Coinbase as any mistake at this point will result in unrecoverable coins. Input the amount you wish to send. Return to Coinbase and wait for the transactions to be confirmed. LTC often takes about 30 minutes before enough confirmations are registered. After Confirmation, go to the buy/sell page on Coinbase. Sell your currency of choice and have it deposit into your bank account. While there is no direct method to sell Verium for fiat, a few methods for an indirect sale exist. Wait for the confirmations required so that the VRM can be credited to your exchange wallet. VRM deposits require 30 confirmations, which can take up to two hours. Exchange VRM to ETH or LTC or BTC. We advise avoiding using BTC as the fees to transfer it to Coinbase are quite high. Click receive on whichever currency you converted your VRM into. Bittrex is a next generation crypto trading platform built and operated in the United States by crypto enthusiasts with extensive development and security background. A US exchange trading in numerous virtual currencies, including Bitcoin, Ethereum,  Litecoin, VeriCoin and Dogecoin. For a crypto to crypto exchange there is good security and decent volume and Order book depth for the majority of its trading pairs. Trading fees are flat at 0.2% and deposit and withdrawal fees are subject to the blockchain’s specific minimum transaction fee. Livecoin is a modern service for accessing cryptocurrency exchange markets. You are provided with a comfortable, practical and profitable platform with which to work with cryptocurrencies – suitable for both beginners and experienced traders. Since March 21, 2014 on the market, Bleutrade is a startup focused on cryptocurrency exchange based in Brazil, Porto Digital (Recife/Pernambuco), a leading technology hubs in Latin America known as the Brazilian Silicon Valley. Bleutrade is an exchange that allows users to exchange cryptocurrencies freely with each other, with safety and practicality, from any country in the world. Just have learned how to report crypto tax to IRS. It almost made me crazy but I got it through. Now I have some tips for everyone: 1. Using cointracking.com; 2. choose "transaction prices"; 3. Use HPFO (high price in and first out. These tips will minimize the overall tax paid to IRS. Any loses in crypto can be used to lower your taxes as it's treated like stock in the US. So that is a huge advantage of reporting if you've lost money. Also if you ever make a large purchase (for instance buy a house) with your earnings from crypto you must show where this money came from and if you haven't paid taxes on it you can be subject to large fines and/or jail time for tax evasion. All in all, in the US at least, it's worth it to be on the safe side and just pay the taxes. Plus as others have said taxes go towards roads, emergency services, schools, etc, etc. so it's worth it to do your part. i used the FIFO method, because i feel the US govt will enforce this treatment in the future. There is not much difference between FIFO and HPFO. Whatever you use, the overall tax along time could be the same. Just stick to HPFO if you used it initially. In US, we have to report the cypto exchange even for crypto to crypto. Good news we still have the chance to avoid tax in 2017 for crypto to cypto may still be considered and like-kind asset exchange. This page was last modified on 12 April 2018, at 11:56.